For the view from above the astronomical object's surface, see Extraterrestrial atmospheres. In astronomy, an extraterrestrial sky is a view of outer space from the surface of an astronomical body other than Earth. The only extraterrestrial sky that has been directly observed and photographed by astronauts is that of the Moon. The skies of Titan, Mars, and Venus have been observed by space probes designed to land on the surface and transmit images back to Earth. Characteristics of extraterrestrial skies appear to vary substantially due to a number of factors. An extraterrestrial atmosphere, if present, has a large bearing on visible characteristics. The atmosphere's density and chemical composition can contribute to differences in colour, opacity (including haze) and the presence of clouds. Astronomical objects may also be visible and can include natural satellites, rings, star systems and nebulas and other planetary system bodies. For skies that have not been directly or indirectly observed, their appearance can be simulated based on known parameters, such as the position of astronomical objects relative to the surface and atmospheric composition. Where "distance" can be in km, au, or any other appropriate unit. To illustrate, since Pluto is 40 au away from the Sun on average, it follows that the parent star would appear to be 1,600 times dimmer than it is on Earth. Though a terrestrial observer would find a dramatic decrease in available sunlight in these environments, the Sun would still be bright enough to cast shadows even as far as the hypothetical Planet Nine, possibly located 1,200 AU away, and would still outshine the full Moon. On terrestrial planets and other solid celestial bodies with negligible atmospheric effects, the distance to the horizon for a "standard observer" varies as the square root of the planet's radius. Thus, the horizon on Mercury is 62% as far away from the observer as it is on Earth, on Mars the figure is 73%, on the Moon the figure is 52%, on Mimas the figure is 18%, and so on. For smaller, non-spherical objects, the observer's height must be taken into account when calculating the distance to the horizon. Because Mercury has little or no atmosphere, a view of the planet's skies would be no different from viewing space from orbit. Mercury has a southern pole star, α Pictoris, a magnitude 3.2 star. It is fainter than Earth's Polaris (α Ursae Minoris). On average, the visible diameter of the Sun on Mercury is 2.5 times as large as it appears from Earth, and its total brightness is more than 6 times as great. Because of the planet's eccentric orbit, the Sun's apparent diameter in the sky would vary from 2.2 times that from Earth at aphelion (with total brightness 4.8 times as great), to 3.2 times at perihelion (with total brightness 10.2 times as great). The large eccentricity of Mercury's orbit coupled with the long length of a Mercurian day results in an unusual effect in which the Sun appears to briefly reverse its usual east-to-west motion once every Mercurian year. The on-sky distance over which the Sun appears to be travelling in this reversed (west-to-east) direction is slightly larger than the apparent size of the Sun itself. Thus, while the effect is visible wherever one happens to be on Mercury, there are certain points on Mercury's surface where an observer would be able to see the Sun rise, reverse and set, and then rise again, all within the same Mercurian day. The apparent motion reverses because approximately four (Earth) days prior to perihelion, the angular speed of Mercury's orbit exactly equals its rotational velocity, so that the Sun's apparent motion ceases. At perihelion, Mercury's orbital angular velocity slightly exceeds the rotational velocity, so the Sun appears to be retrograde. Four days after perihelion, the Sun's normal apparent motion resumes. Because of its spin–orbit resonance, Mercury presents one of two spots of its surface to the Sun on alternate perihelia. One of these subsolar points is Caloris Planitia ("hot basin"), appropriately named because an observer near its centre would see the Sun loop around the zenith once per Mercurian day, and subsequently experience a very hot day indeed. After the Sun, the second-brightest object in the Mercurian sky is Venus, which is much brighter there than for terrestrial observers. The reason for this is that when Venus is closest to Earth, it is between the Earth and the Sun, so we see only its night side. Indeed, even when Venus is brightest in the Earth's sky, we are actually seeing only a narrow crescent. For a Mercurian observer, on the other hand, Venus is closest when it is in opposition to the Sun and is showing its full disk. The apparent magnitude of Venus is as bright as −7.7. The Earth and the Moon are also very prominent, their apparent magnitudes being about −5 and −1.2, respectively. The maximum apparent distance between the Earth and the Moon is about 15′. All other planets are visible just as they are on Earth, but somewhat less bright at opposition. The zodiacal light is probably more prominent than it is from Earth. The atmosphere of Venus is so thick that the Sun is not distinguishable in the daytime sky, and the stars are not visible at night. Color images taken by the Soviet Venera probes suggest that the sky on Venus is orange. If the Sun could be seen from Venus's surface, the time from one sunrise to the next (a solar day) would be 116.75 Earth days. Because of Venus's retrograde rotation, the Sun would appear to rise in the west and set in the east. An observer aloft in Venus's cloud tops, on the other hand, would circumnavigate the planet in about four Earth days and see a sky in which Earth and the Moon shine brightly (about magnitudes −6.6 and −2.7, respectively) at opposition. Mercury would also be easy to spot, because it is closer and brighter, at up to magnitude −2.7, and because its maximum elongation from the Sun is considerably larger (40.5°) than when observed from Earth (28.3°). The Moon's atmosphere is negligibly thin, essentially vacuum, so its sky is always black, as in the case of Mercury. However, the Sun is so bright that it is impossible to see stars during the daytime, unless the observer is well shielded from sunlight (direct or reflected from the ground). The Moon has a southern polar star, δ Doradus, a magnitude 4.34 star. It is better aligned than Earth's Polaris (α Ursae Minoris), but much fainter. The Sun looks the same from the Moon as it does from Earth's orbit, somewhat brighter than it does from the Earth's surface, and colored pure white, due to the lack of atmospheric scattering and absorption. Since the Moon's axial tilt relative to its orbit around the Sun is nearly zero, the Sun traces out almost exactly the same path through the Moon's sky over the course of a year. As a result, there are craters and valleys near the Moon's poles that never receive direct sunlight, and there may exist mountains and hilltops that are never in shadow (see Lunar south pole and Peak of eternal light). Among the most prominent features of the Moon's sky is Earth. Earth's angular diameter (1.9°) is four times the Moon's as seen from Earth, although because the Moon's orbit is eccentric, Earth's apparent size in the sky varies by about 5% either way (ranging between 1.8° and 2.0° in diameter). Earth shows phases, just like the Moon does for terrestrial observers. The phases, however, are opposite; when the terrestrial observer sees the full Moon, the lunar observer sees a "new Earth", and vice versa. Earth's albedo is three times as high as that of the Moon (due in part to its whitish cloud cover), and coupled with the wider area, the full Earth glows over 50 times brighter than the full Moon at zenith does for the terrestrial observer. This Earth light reflected on the Moon's un-sunlit half is bright enough to be visible from Earth, even to the unaided eye – a phenomenon known as earthshine. As a result of the Moon's synchronous rotation, one side of the Moon (the "near side") is permanently turned towards Earth, and the other side, the "far side", mostly cannot be seen from Earth. This means, conversely, that Earth can only be seen from the near side of the Moon and would always be invisible from the far side. If the Moon's rotation were purely synchronous, Earth would not have any noticeable movement in the Moon's sky. However, due to the Moon's libration, Earth does perform a slow and complex wobbling movement. Once a month, as seen from the Moon, Earth traces out an approximate oval 18° in diameter. The exact shape and orientation of this oval depend on one's location on the Moon. As a result, near the boundary of the near and far sides of the Moon, Earth is sometimes below the horizon and sometimes above it. Earth and the Sun sometimes meet in the lunar sky, causing an eclipse. On Earth, one would see a lunar eclipse, when the Moon passes through the Earth's shadow; meanwhile on the Moon, one would see a solar eclipse, when the Sun goes behind the Earth. Since the apparent diameter of the Earth is four times as large as that of the Sun, the Sun would be hidden behind the Earth for hours. Earth's atmosphere would be visible as a reddish ring. 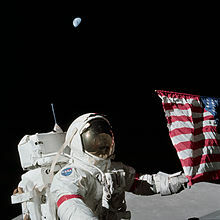 During the Apollo 15 mission, an attempt was made to use the Lunar Roving Vehicle's TV camera to view such an eclipse, but the camera or its power source failed after the astronauts left for Earth. Terrestrial solar eclipses, on the other hand, would not be as spectacular for lunar observers because the Moon's umbra nearly tapers out at the Earth's surface. A blurry dark patch would barely be visible. The effect would be comparable to the shadow of a golf ball cast by sunlight on an object 5 m (16 ft) away. Lunar observers with telescopes might be able to discern the umbral shadow as a black spot at the center of a less dark region (penumbra) traveling across the full Earth's disk. It would look essentially the same as it does to the Deep Space Climate Observatory. In summary, whenever an eclipse of some sort is occurring on Earth, an eclipse of another sort is occurring on the Moon. Eclipses occur for observers on both Earth and the Moon whenever the two bodies and the Sun align in a straight line, or syzygy. Mars has only a thin atmosphere; however, it is extremely dusty and there is much light that is scattered about. The sky is thus rather bright during the daytime and stars are not visible. The Martian northern pole star is Deneb (although the actual pole is somewhat offset in the direction of Alpha Cephei). Generating accurate true-color images from Mars's surface is surprisingly complicated. To give but one aspect to consider, there is the Purkinje effect: the human eye's response to color depends on the level of ambient light; red objects appear to darken faster than blue objects as the level of illumination goes down. There is much variation in the color of the sky as reproduced in published images, since many of those images have used filters to maximize their scientific value and are not trying to show true color. For many years, the sky on Mars was thought to be more pinkish than it is now believed to be. On Mars, Rayleigh scattering is usually a very weak effect; the red color of the sky is caused by the presence of iron(III) oxide in the airborne dust particles. These particles are larger in size than gas molecules, so most of the light is scattered by Mie scattering. Dust absorbs blue light and scatters longer wavelengths (red, orange, yellow). The Sun as seen from Mars appears to be ​5⁄8 the angular diameter as seen from Earth (0.35°), and sends 40% of the light, approximately the brightness of a slightly cloudy afternoon on Earth. On June 3, 2014, the Curiosity rover on Mars observed the planet Mercury transiting the Sun, marking the first time a planetary transit has been observed from a celestial body besides Earth. Mars has two small moons: Phobos and Deimos. From the Martian surface, Phobos has one-third to one-half the angular diameter of the Sun while Deimos is barely more than a dot (only 2′ angular diameter). The orbital period of Phobos is so much shorter than the Martian day that the apparent motion of Phobos is in reverse: it rises in the west and sets in the east. Phobos orbits so close (in a low-inclination equatorial orbit) that it cannot be seen north of 70.4°N or south of 70.4°S latitude; high-latitude observers would also notice a decrease in Phobos's apparent size, the additional distance being non-negligible. Phobos's apparent size varies by up to 45% as it passes overhead, due to its proximity to Mars's surface. For an equatorial observer, for example, Phobos is about 0.14° upon rising and swells to 0.20° by the time it reaches the zenith. It crosses the sky swiftly, in about 4.24 hours, every 11.11 hours. Deimos rises in the east and sets in the west, like a "normal" moon, although its appearance to the naked eye would be starlike (angular diameter between 1.8′ and 2.1′). Its brightness would vary between that of Venus and of the star Vega (as seen from Earth). Being relatively close to Mars, Deimos cannot be seen from Martian latitudes greater than 82.7°. Finally, Deimos's orbital period of about 30.3 hours exceeds the Martian rotation period (of about 24.6 hours) by such a small amount that it rises every 5.5 days and takes 2.5 days between rising and setting for an equatorial observer. Thus Phobos crosses the Martian sky nearly 12 times in the time it takes Deimos to cross it just once. Phobos and Deimos can both eclipse the Sun as seen from Mars, although neither can completely cover its disk and so the event is in fact a transit, rather than an eclipse. For a detailed description of such events see the articles Transit of Phobos from Mars and Transit of Deimos from Mars. The Earth is visible from Mars as a double star; the Moon would be visible alongside it as a fainter companion. The maximum visible distance between the Earth and the Moon would be about 25′, at inferior conjunction of the Earth and the Sun (for the terrestrial observer, this is the opposition of Mars and the Sun). Near maximum elongation (47.4°), the Earth and Moon would shine at apparent magnitudes −2.5 and +0.9, respectively. Venus as seen from Mars (when near the maximum elongation from the Sun of 31.7°) would have an apparent magnitude of about −3.2. Compared with their view from Earth, the outer planets (Jupiter, Saturn, Uranus and Neptune) would appear slightly brighter during opposition, but slightly dimmer during conjunction. This effect is most noticeable for Jupiter, and results from Mars' larger orbit compared with that of Earth causing larger variations of interplanetary distance. From Phobos, Mars appears 6,400 times larger and 2,500 times brighter than the full Moon as seen from Earth, and appears as a sphere of angular diameter roughly 42°—taking up a quarter of the width of a celestial hemisphere. From Deimos, Mars appears 1,000 times larger and 400 times brighter than the full Moon as seen from Earth, and appears as a sphere of angular diameter roughly 16.5°—taking up an eleventh of the width of a celestial hemisphere. The asteroid belt is sparsely populated and most asteroids are very small, so that an observer situated on one asteroid would be unlikely to be able to see another without the aid of a telescope. Occasional "close approaches" do occur, but these are spread out over aeons. Some asteroids that cross the orbits of planets may occasionally get close enough to a planet or asteroid so that an observer from that asteroid can make out the disc of the nearby object without the aid of binoculars or a telescope. For example, in September 2004, 4179 Toutatis came about four times the distance from the Earth that the Moon does. 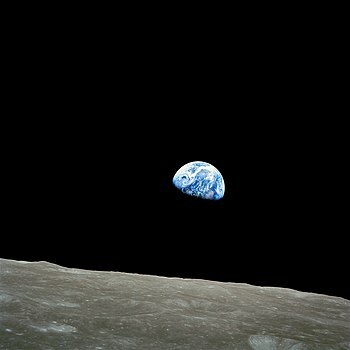 At the closest point in its encounter, the Earth would have appeared about the same size as the Moon appears from Earth. The Moon would also be easily visible as a small shape in Toutatis's sky at that time. Asteroids with unusual orbits also offer a lot to the imagination. For instance, the asteroid (or more likely, extinct comet) 3200 Phaethon has one of the most eccentric orbits: its distance from the Sun varies between 0.14 and 2.4 AU. At perihelion, the Sun would loom over 7 times larger than it does in our sky, and blast the surface with over 50 times as much energy; at aphelion, the Sun would shrink to less than half its apparent diameter on Earth, and give little more than a sixth as much illumination. The asteroid 87 Sylvia is one of the largest main-belt asteroids and the first asteroid observed to have two moons. These moons, Romulus and Remus, would appear roughly the same size. Romulus, the farther one, would be about 0.89° across, slightly bigger than the closer but smaller Remus, which would be about 0.78° across. Because Sylvia is far from spherical, these values can vary by about a little more than 10%, depending on where the observer is on Sylvia's surface. Since the two asteroidal moons appear to orbit (as best we can tell) in the same plane, they would occult each other once every 2.2 days. When the season is right, twice during Sylvia's 6.52 year orbital period, they would eclipse the Sun, which, at 0.15° across, is much smaller than when seen from Earth (0.53°). From Remus, the inner moon, Sylvia is huge, roughly 30°×18° across, while its view of Romulus varies between 1.59 and 0.50° across. From Romulus, Sylvia measures 16°×10° across, while Remus varies between 0.62° and 0.19°. The asteroid 243 Ida was visited by the Galileo spacecraft on its way to Jupiter. It discovered a small moon named Dactyl. Although the exact orbital characteristics of Dactyl are not fully known, it was 90 kilometers from Ida when Galileo passed by. This would mean that from Ida, Dactyl would appear as large as 1.76 degrees across, which is huge for such a small moon (1.4 km). Although no images from within Jupiter's atmosphere have ever been taken, artistic representations typically assume that the planet's sky is blue, though dimmer than Earth's, because the sunlight there is on average 27 times fainter, at least in the upper reaches of the atmosphere. The planet's narrow rings might be faintly visible from latitudes above the equator. Further down into the atmosphere, the Sun would be obscured by clouds and haze of various colors, most commonly blue, brown, and red. Although theories abound on the cause of the colors, there is currently no unambiguous answer. From Jupiter, the Sun appears to cover only 5 arcminutes, less than a quarter of its size as seen from Earth. Aside from the Sun, the most prominent objects in Jupiter's sky are the four Galilean moons. Io, the nearest to the planet, would be slightly larger than the full moon in Earth's sky, though less bright, and would be the largest moon in the Solar System as seen from its parent planet. The higher albedo of Europa would not overcome its greater distance from Jupiter, so it would not outshine Io. In fact, the low solar constant at Jupiter's distance (3.7% Earth's) ensures that none of the Galilean satellites would be as bright as the full moon is on Earth; from Io to Callisto their apparent magnitudes would be: −11.2, −9.7, −9.4, and −7.0. Ganymede, the largest moon and third from Jupiter, is almost as bright as Io and Europa, but appears only half the size of Io. However, its great size means that it appears about 2″ larger than Europa. Also, a triple conjunction of Io, Europa and Ganymede would be impossible, because the Laplace resonance that they share prevents this. When two of the Galilean moons are aligned, the third is never less than 90 degrees to the left or right of these moons in its orbit. Callisto, still further out, would appear only a quarter the size of Io. None of the surface features on Jupiter's moons would appear as prominent as the lunar maria do when the Moon is viewed from Earth. Dark and light patches would be visible on Io's surface due to the coloration of sulfur that covers Io, and the largest volcanoes would be designated by dark points, but the lack of large, contrasting features results in a poor view of it. Europa, however, would appear as a completely featureless white disc. Even when viewed from nearby, most spacecraft images use contrast enhancements to clearly show the cracks in the Europan ice, which are only about 10–15 percent darker than the rest of the surface. Vague dark and light patches would be visible on Ganymede, whereas Callisto is much too distant for any features to be made out. All four Galilean moons stand out because of the swiftness of their motion, compared to the Moon. They are all also large enough to fully eclipse the Sun. Because Jupiter's axial tilt is minimal, and the Galilean moons all orbit in the plane of Jupiter's equator, solar eclipses are quite common. Jupiter's small inner moons appear only as starlike points except Amalthea, which can occasionally appear as large as Callisto. However, they would all be brighter than any star, ranging from magnitudes −1.5 to −4.9. The outer moons would be invisible except for Himalia, which would appear as a dim, starlike point to the naked eye (magnitude +5.5) only under favorable circumstances (if its periapsis happens to coincide exactly with its full phase). None of Jupiter's moons have more than traces of atmosphere, so their skies are black or very nearly so. For an observer on one of the moons, the most prominent feature of the sky by far would be Jupiter. For an observer on Io, the closest large moon to the planet, Jupiter's apparent diameter would be about 20° (38 times the visible diameter of the Moon, covering 1% of Io's sky). An observer on Metis, the innermost moon, would see Jupiter's apparent diameter increased to 68° (130 times the visible diameter of the Moon, covering 18% of Metis's sky). A "full Jupiter" over Metis shines with about 4% of the Sun's brightness (light on Earth from a full moon is 400 thousand times dimmer than sunlight). Because the inner moons of Jupiter are in synchronous rotation around Jupiter, the planet always appears in nearly the same spot in their skies (Jupiter would wiggle a bit because of the non-zero eccentricities). Observers on the sides of the Galilean satellites facing away from the planet would never see Jupiter, for instance. From the moons of Jupiter, solar eclipses caused by the Galilean satellites would be spectacular, because an observer would see the circular shadow of the eclipsing moon travel across Jupiter's face. The sky in the upper reaches of Saturn's atmosphere is blue (from imagery of the Cassini mission at the time of its September 2017 demise), but the predominant color of its cloud decks suggests that it may be yellowish further down. Observations from spacecraft show that seasonal smog develops in Saturn's southern hemisphere at its perihelion due to its axial tilt. This could cause the sky to become yellowish at times. As the northern hemisphere is pointed towards the sun only at aphelion, the sky there would likely remain blue. The rings of Saturn are almost certainly visible from the upper reaches of its atmosphere. The rings are so thin that from a position on Saturn's equator, they would be almost invisible. However, from anywhere else on the planet, they could be seen as a spectacular arc stretching across half the celestial hemisphere. Saturn's moons would not look particularly impressive in its sky, as most are fairly small, and the largest are a long way from the planet. Even Titan, the largest moon of Saturn, appears only half the size of Earth's moon, and only grows as bright as −7. In fact, Titan is the dimmest of Saturn's large moons due to its great distance and low albedo; Mimas, Enceladus, Tethys, Dione, and Rhea are all brighter, at magnitudes −7.8, −7.9, −8.8, −8, and −7.8, respectively. Here are the approximate angular diameters of the main moons (for comparison, Earth's moon has an average angular diameter of 31′): Mimas: 7–11′, Enceladus: 7–9′, Tethys: 12–15′, Dione: 10–12′, Rhea: 8–11′, Titan: 14–15′, Iapetus: 1′. Most of the inner moons would appear as bright, starlike points (with the exception of Janus, which would appear 7 arcseconds across at its zenith), although most would shine brighter than any star; for example, Janus and Epimetheus would both shine as bright as magnitude −6. Meanwhile, none of the outer moons would be visible except Phoebe, which nears the naked eye limit (6.2–6.6) even at full phase. Saturn has a southern polar star, δ Octantis, a magnitude 4.3 star. It is much fainter than Earth's Polaris (α Ursae Minoris). Since the inner moons of Saturn are all in synchronous rotation, the planet always appears in the same spot in their skies. Observers on the sides of those satellites facing away from the planet would never see Saturn. In the skies of Saturn's inner moons, Saturn is an enormous object. For instance, Saturn seen from Pan has an apparent diameter of ~50°, 104 times larger than our Moon and occupying 11% of Pan's sky. Because Pan orbits along the Encke division within Saturn's rings, they are visible from anywhere on Pan, even on its side facing away from Saturn. Saturn's rings would not be prominent from most of the moons. This is because the rings, though wide, are not very thick, and most of the moons orbit almost exactly (within 1.5°) in the planet's ring plane. Thus, the rings are edge-on and practically invisible from the inner moons. From the outer moons, starting with Iapetus, a more oblique view of the rings would be available, although the greater distance would make Saturn appear smaller in the sky; from Phoebe, the largest of Saturn's irregular moons, Saturn would appear only as big as the full Moon does from Earth. The play of distance and angle is quite sensitive to the values used, but calculations show the best view of the rings would be achieved from the inner moon Mimas, which lies a full 1.5° off Saturn's equatorial plane and is fairly near the rings. At their widest opening, when Mimas is at its maximum distance from Saturn's equatorial plane, the edges of the rings (from B to A) would be separated by 2.7 degrees. The co-orbitals Epimetheus and Janus would also get a good view, with maximum opening angles ranging between 1.5 and 2.9°. Tethys gets the next best view, with nearly half a degree. Iapetus achieves 15.47°, which is more than any of the outer moons can claim. Titan is the only moon in the Solar System to have a thick atmosphere. 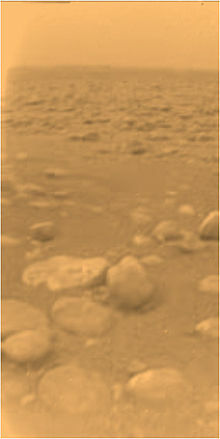 Images from the Huygens probe show that the Titanean sky is a light tangerine color. However, an astronaut standing on the surface of Titan would see a hazy brownish/dark orange color. As a consequence of its greater distance from the Sun and the opacity of its atmosphere, the surface of Titan receives only about ​1⁄3000 of the sunlight Earth does – daytime on Titan is thus only as bright as twilight on the Earth. It seems likely that Saturn is permanently invisible behind orange smog, and even the Sun would only be a lighter patch in the haze, barely illuminating the surface of ice and methane lakes. However, in the upper atmosphere, the sky would have a blue color and Saturn would be visible. With its thick atmosphere and methane rain, Titan is the only celestial body other than Earth upon which rainbows could form. However, given the extreme opacity of the atmosphere in visible light, the vast majority would be in the infrared. Seen from Enceladus, Saturn would have a visible diameter of almost 30°, sixty times more than the Moon visible from Earth. Moreover, since Enceladus rotates synchronously with its orbital period and therefore keeps one face pointed toward Saturn, the planet never moves in Enceladus's sky (albeit with slight variations coming from the orbit's eccentricity), and cannot be seen from the far side of the satellite. Saturn's rings would be seen from an angle of only 0.019° and be almost invisible, but their shadow on Saturn's disk would be clearly distinguishable. Like our own Moon from Earth, Saturn itself would show regular phases. From Enceladus, the Sun would have a diameter of only 3.5 minutes of arc, one-ninth that of the Moon as seen from Earth. An observer located on Enceladus could also observe Mimas (the biggest satellite located inside Enceladus's orbit) transit in front of Saturn every 72 hours, on average. Its apparent size would be at most 26 minutes of arc, about the same size as the Moon seen from Earth. Pallene and Methone would appear nearly star-like (maximum 30 seconds of arc). Tethys, visible from Enceladus's anti-Saturnian side, would reach a maximum apparent size of about 64 minutes of arc, about twice that of the Moon as seen from the Earth. Judging by the color of its atmosphere, the sky of Uranus is probably a light blue, i.e. cyan color. It is unlikely that the planet's rings can be seen from its surface, as they are very thin and dark. Uranus has a northern polar star, Sabik (η Ophiuchi), a magnitude 2.4 star. Uranus also has a southern polar star, 15 Orionis, an unremarkable magnitude 4.8 star. Both are fainter than Earth's Polaris (α Ursae Minoris), although Sabik only slightly. Uranus is unusual in that the obliquity of its ecliptic is 82° (angle between the orbital and rotational poles). The North Pole of Uranus points to somewhere near η Ophiuchi (in Earth's southern celestial hemisphere), about 15° northeast of Antares, and its South Pole halfway between Betelgeuse and Aldebaran. Uranus's "tropics" lie at 82° latitude and its "Arctic circles" at 8° latitude. On December 17, 2007, the Sun passed the Uranian celestial equator to the North and in 2029 the North Pole of Uranus will be nearly pointed at the Sun. None of Uranus's moons would appear as large as a full moon on Earth from the surface of their parent planet, but the large number of them would present an interesting sight for observers hovering above the cloudtops. The angular diameters of the five large moons are as follows (for comparison, Earth's moon measures on average 31′ for terrestrial observers): Miranda, 11–15′; Ariel, 20–23′; Umbriel, 15–17′; Titania, 11–13′; Oberon, 8–9′. Unlike on Jupiter and Saturn, many of the inner moons can be seen as disks rather than starlike points; the moons Portia and Juliet can appear around the size of Miranda at times, and a number of other inner moons appear larger than Oberon. Several others range from 6′ to 8′. The outer irregular moons would not be visible to the naked eye. However, the low light levels at such a great distance from the sun ensure that the moons appear very dim; the brightest, Ariel, would only shine at magnitude −7.4, more than 100 times dimmer than the moon as seen from Earth. Meanwhile, the outer large moon Oberon would only be as bright as magnitude −4.9, about the same as Venus despite its proximity. Simulated view of Triton in the sky of Neptune. Judging by the color of its atmosphere, the sky of Neptune is probably an azure or sky blue, similar to Uranus'. As in the case of Uranus, it is unlikely that the planet's rings can be seen from its surface, as they are very thin and dark. Aside from the Sun, the most notable object in Neptune's sky is its large moon Triton, which would appear slightly smaller than a full Moon on Earth. It moves more swiftly than our Moon, because of its shorter period (5.8 days) compounded by its retrograde orbit. The smaller moon Proteus would show a disk about half the size of the full Moon. Surprisingly, Neptune's small inner moons all cover, at some point in their orbits, more than 10′ in Neptune's sky. At some points, Despina's angular diameter rivals that of Ariel from Uranus and Ganymede from Jupiter. Here are the angular diameters for Neptune's moons (for comparison, Earth's moon measures on average 31′ for terrestrial observers): Naiad, 7–13′; Thalassa, 8–14′; Despina, 14–22′; Galatea, 13–18′; Larissa, 10–14′; Proteus, 12–16′; Triton, 26–28′. An alignment of the inner moons would likely produce a spectacular sight. Neptune's large outer satellite, Nereid, is not large enough to appear as a disk from Neptune, and is not noticeable in the sky, as its brightness at full phase varies from magnitude 2.2–6.4, depending on which point in its eccentric orbit it happens to be. The other irregular outer moons would not be visible to the naked eye, although a dedicated telescopic observer could potentially spot some at full phase. As with Uranus, the low light levels cause the major moons to appear very dim. The brightness of Triton at full phase is only −7.11, despite the fact that Triton is more than four times as intrinsically bright as Earth's moon and orbits much closer to Neptune. Triton, Neptune's largest moon, has an atmosphere, but it is so thin that its sky is still black, possibly with some pale haze at the horizon. Because Triton orbits with synchronous rotation, Neptune always appears in the same position in its sky. Triton's rotation axis is inclined 130° to Neptune's orbital plane and thus points within 40° of the Sun twice per Neptunian year, much like Uranus's. As Neptune orbits the Sun, Triton's polar regions take turns facing the Sun for 82 years at a stretch, resulting in radical seasonal changes as one pole, then the other, moves into the sunlight. Neptune itself would span 8 degrees in Triton's sky, though with a maximum brightness roughly comparable to that of the full moon on Earth it would appear only about ​1⁄256 as bright as the full moon, per unit area. Due to its eccentric orbit, Nereid would vary considerably in brightness, from fifth to first magnitude; its disk would be far too small to see with the naked eye. Proteus would also be difficult to resolve at just 5–6 arcminutes across, but it would never be fainter than first magnitude, and at its closest would rival Canopus. A trans-Neptunian object is any minor planet in the Solar System that orbits the Sun at a greater average distance (semi-major axis) than Neptune, 30 astronomical units (AU). Pluto, accompanied by its largest moon Charon, orbits the Sun at a distance usually outside the orbit of Neptune except for a twenty-year period in each orbit. From Pluto, the Sun is point-like to human eyes, but still very bright, giving roughly 150 to 450 times the light of the full Moon from Earth (the variability being due to the fact that Pluto's orbit is highly elliptical, stretching from just 4.4 billion km to over 7.3 billion km from the Sun). Nonetheless, human observers would find a large decrease in available light. Pluto's atmosphere consists of a thin envelope of nitrogen, methane, and carbon monoxide gases, all of which are derived from the ices of these substances on its surface. When Pluto is close to the Sun, the temperature of Pluto's solid surface increases, causing these ices to sublimate into gasses. This atmosphere also produces a noticeable blue haze that is visible at sunset and possibly other times of the Plutonian day. Pluto and Charon are tidally locked to each other. This means that Charon always presents the same face to Pluto, and Pluto also always presents the same face to Charon. Observers on the far side of Charon from Pluto would never see the dwarf planet; observers on the far side of Pluto from Charon would never see the moon. Every 124 years, for several years it is mutual-eclipse season, during which Pluto and Charon each alternatively eclipse the Sun for the other at intervals of 3.2 days. Charon, as seen from Pluto's surface at the sub-Charon point, has an angular diameter of about 3.8°, nearly eight times the Moon's angular diameter as seen from Earth and about 56 times the area. It would be a very large object in the night sky. View from Hydra. Pluto and Charon (right); Nix (left) (artist concept). View from Pluto. Sun (right-top); Charon (left) (artist concept). View from Pluto of Charon and the Sun (artist concept). Pluto by moonlight (artist concept). Near-sunset view includes several layers of atmospheric haze. Quaoar is a Kuiper belt object with a circular orbit and moderate inclination. From its surface and at the average distance between its perihelion and aphelion the Sun would have an angular diameter of 44.2″ (arcseconds) comparable to the maximum diameter of Venus of 63.0″; the human eye has a resolution of 72″, so the Sun from Quaoar's surface would appear as a point. The Sun's apparent magnitude would be −18.56, in comparison the magnitude of the Moon at full phase is −12.74, so the Sun would appear on Quaoar as a point of light 212 times brighter than a full Moon on Earth. The amount of light depends on the atmosphere: if present the amount of light received at noon would be similar to the light at dusk or dawn on Earth. Quaoar's moon Weywot has an angular diameter of 15.9′ (arcminutes) at apoapsis and 21.4′ at periapsis, in comparison the Moon's angular diameter varies between 29.4′ and 33.5′. In comparison to the size of the Sun from Quaoar's surface Weywot would appear much bigger: 15.9′ is equal to 954″ or 21.6 times the diameter of the Sun as seen from Quaoar. Most solar eclipses would be total and a partial eclipse would be extremely rare. At full phase Weywot's visual magnitude is −3.24 somewhere between Jupiter's maximum magnitude (−2.94) and Venus's minimum magnitude (−3.82), in comparison the Moon at full phase is 6,301 times brighter than Weywot. Quaoar's umbra extends 5,180,390 km and at the distance of Weywot's apoapsis it would have a diameter of 1,106.5 km or 15 times Weywot's diameter. In comparison, Earth's umbra at the Moon's position is 2.65 times wider. Weywot's inclination is not determined yet, it's either 14° or 30°, if we assume the smaller value then Weywot's center at apoapsis can be up to 4,121 km above or below Quaoar's equatorial plane, this mean for most of the time Weywot is outside of the umbra completely. The sky of a comet changes dramatically as it nears the Sun. During perihelion, a comet's ices begin to sublime from its surface, forming tails of gas and dust, and a coma. An observer on a comet nearing the Sun might see the stars slightly obscured by a milky haze, which could create halo effects around the Sun and other bright objects. For observers on extrasolar planets, the constellations would differ depending on the distances involved. The view of outer space of exoplanets can be extrapolated from open source software such as Celestia or Stellarium, and it appears that due to parallax, distant stars change their position less than nearby ones. For alien observers, the Sun would be visible to the naked human eye only at distances below 20 – 27 parsec (60–90 ly). [nb 1] If the Sun were to be observed from another star, it would always appear on the opposite coordinates in the sky. Thus an observer located near a star with RA at 4 hr and declination −10 would see the Sun located at RA: 16 hr, dec: +10. A consequence of observing the universe from other stars is that stars that may appear bright in our own sky may appear dimmer in other skies and vice versa. If the Sun were to be observed from the Alpha Centauri system, the nearest star system to ours, it would appear to be a 0.46 magnitude star in the constellation Cassiopeia, and would create a "/W" shape instead of the "W" as seen from Earth. Due to the proximity of the Alpha Centauri system, the constellations would, for the most part, appear similar. However, there are some notable differences with the position of other nearby stars; for example, Sirius would appear about one degree from the star Betelgeuse in the constellation Orion. Also, Procyon would appear in the constellation Gemini, about 13 degrees below Pollux. A planet around either α Centauri A or B would see the other star as a very bright secondary. For example, an Earth-like planet at 1.25 astronomical units from α Cen A (with a revolution period of 1.34 years) would get Sun-like illumination from its primary, and α Cen B would appear 5.7 to 8.6 magnitudes dimmer (−21.0 to −18.2), 190 to 2,700 times dimmer than α Cen A but still 150 to 2,100 times brighter than the full Moon. Conversely, an Earth-like planet at 0.71 AU from α Cen B (with a revolution period of 0.63 years) would get Sun-like illumination from its primary, and α Cen A would appear 4.6 to 7.3 magnitudes dimmer (−22.1 to −19.4), 70 to 840 times dimmer than α Cen B but still 470 to 5,700 times brighter than the full Moon. In both cases the secondary sun would, in the course of the planet's year, appear to circle the sky. It would start off right beside the primary and end up, half a period later, opposite it in the sky (at "full"). After another half period, it would complete the cycle. Other planets orbiting one member of a binary system would enjoy similar skies. The angular separation between the two stars would not be exactly the same after one orbit of the planet however, because during that time the parent star will have completed part of its orbit around the other star in the system. From 40 Eridani, 16 light years away, the Sun would be an average looking star of about apparent magnitude 3.3 in the constellation Serpens Caput. At this distance most of the stars nearest to us would be in different locations to those in our sky, including Alpha Centauri, Sirius, and Procyon. From a planet orbiting Aldebaran, 65 light years away, our Sun would be seen as an insignificant 6.4 magnitude star between Ophiuchus and Scorpius (more specifically, it would in the vicinity of Phi Ophiuchi and 24 Scorpii). Constellations made of bright, distant stars would look somewhat similar (such as Orion and Scorpius) but much of the night sky would seem unfamiliar to someone from Earth. Even Orion would appear somewhat different; viewed from this position, Alnilam and Mintaka would appear to be on top of each other, only 15 arcminutes apart, thus reducing the belt to two stars. Also Bellatrix would be much closer to the belt, making the "chest" somewhat smaller. From a viewpoint in the LMC, the Milky Way's total apparent magnitude would be −2.0—over 14 times brighter than the LMC appears to us on Earth—and it would span about 36° across the sky, the width of over 70 full moons. Furthermore, because of the LMC's high galactic latitude, an observer there would get an oblique view of the entire galaxy, free from the interference of interstellar dust that makes studying in the Milky Way's plane difficult from Earth. The Small Magellanic Cloud would be about magnitude 0.6, substantially brighter than the LMC appears to us. ^ These numbers are extrapolated from the fact that the human eye can generally see up to magnitude 6.5 on Earth, while it can see up to magnitude 7 under the best possible conditions. ^ "Thin Atmosphere of Mercury, Formation and Composition – Windows to the Universe". www.windows.ucar.edu. ^ Seligman, Courtney. "The Rotation of Mercury". cseligman.com. Retrieved October 18, 2015. ^ a b c d e f Perelman, Yakov; Shkarovsky-Raffe, Arthur (2000). Astronomy for Entertainment. University Press of the Pacific. ISBN 978-0-89875-056-0. ^ "Venera 13 – Missions – NASA Solar System Exploration". NASA Solar System Exploration. ^ "The Terrestrial Planets". The Planetary Society. Archived from the original on 21 August 2011. Retrieved 3 August 2007. ^ "Return to Orbit". www.hq.nasa.gov. ^ Plait, Phil. "Phil Plait's Bad Astronomy: Misconceptions: What Color is Mars?". www.badastronomy.com. ^ a b Webster, Guy (June 10, 2014). "Mercury Passes in Front of the Sun, as Seen From Mars". NASA. Retrieved June 10, 2014. ^ Revkin, Andrew C. (February 6, 2014). "Martian View of Our Pale Dot". The New York Times. Retrieved February 9, 2014. ^ a b c Bagenal, Fran (2005). "Class 17 – Giant Planets". Laboratory for Atmospheric and Space Physics. Retrieved September 5, 2008. ^ This and other simulated images on this page were made with the Celestia space simulation software. ^ Cook, Jia-Rui C.; Gutro, Rob; Brown, Dwayne; Harrington, J. D.; Fohn, Joe (December 12, 2013). "Hubble Sees Evidence of Water Vapor at Jupiter Moon". NASA. Retrieved December 12, 2013. ^ "Pre-eclipse of the Sun by Callisto from the center of Jupiter". JPL Solar System Simulator. June 3, 2009. Retrieved June 4, 2008. ^ Thommes, Jim. "Jupiter Moon Shadow Transit". Jim Thommes Astrophotography. Retrieved September 3, 2008. ^ Pascal, René. "POV-Ray renderings of Huygens descending to Titan". www.beugungsbild.de. ^ "Rainbows on Titan". NASA. Retrieved October 8, 2011. ^ Plait, Phil (March 15, 2012). "BAFact math: How bright is the Sun from Pluto?". Discover Magazine. Retrieved July 6, 2015. ^ "New Horizons shows Pluto sporting blue skies and red water ice". ^ "Vmag<6.5". SIMBAD Astronomical Database. Retrieved June 26, 2010. ^ Bortle, John E. (February 2001). "The Bortle Dark-Sky Scale". Sky & Telescope. Retrieved November 18, 2009. ^ St. Fleur, Nicholas (May 19, 2017). "Spotting Mysterious Twinkles on Earth From a Million Miles Away". The New York Times. Retrieved May 20, 2017. ^ Marshak, Alexander; Várnai, Tamás; Kostinski, Alexander (May 15, 2017). "Terrestrial glint seen from deep space: oriented ice crystals detected from the Lagrangian point". Geophysical Research Letters. 44 (10): 5197–5202. Bibcode:2017GeoRL..44.5197M. doi:10.1002/2017GL073248. ^ Some of the figures in the "View" section were extrapolated from data in the Appendix of Chaisson and McMillan's Astronomy Today (Englewood Cliffs: Prentice-Hall, Inc., 1993). Carroll, Michael (2007). Space art : how to draw and paint planets, moons, and landscapes of alien worlds. New York: Watson-Guptil Publications. ISBN 9780823048762. Carroll, Michael (2010). Drifting on Alien Winds Exploring the Skies and Weather of Other Worlds. New York, NY: Springer Science+Business Media, LLC. ISBN 9781441969170. Barnett, Lincoln (December 20, 1954). "The Starry Universe". Life: 44–64. Retrieved April 12, 2013. Perelman, Y. (2000). "Lunar heavens". Astronomy for entertainment. Honolulu: University Press of the Pacific. pp. 78–84. ISBN 9780898750560. Essay on the possible sky colours of alien worlds. The Starry Universe – Life magazine (December 20, 1954).